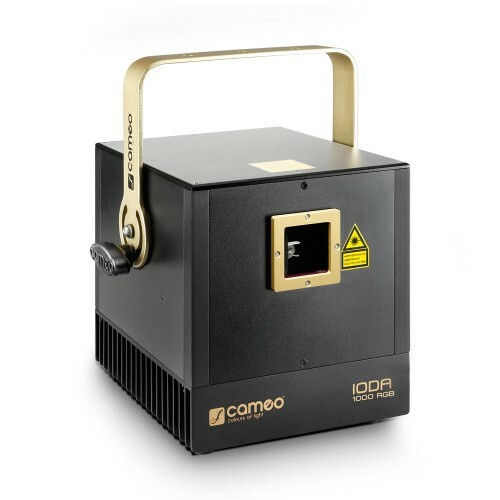 With a strong output of 1,000 mW and red, green and blue color mixes the IODA 1000 RGB features diode and DPSS lasers with 3 mm beam diameters and a maximum divergence of 1.5 mrad only.The red 638 nm diode achieves a significantly better visibility than a conventional 650 nm diode and makes the IODA 1000 RGB the ideal choice for highly professional laser shows. With analog modulation for up to 16 million color hues the Ioda Series professional show lasers generate stunning graphics projections with razor-sharp beams. Their dust proof dual layer aluminium enclosures separate the optical components from the power supply and fan to ensure maximum performance while minimizing maintenance. All Ioda laser lights sport high speed 30 Kpps scanners @ 8 degrees ILDA, a 60° scan angle and 128 impressive pattern presets. They provide an ILDA interface on 25-pin D-sub connectors for computer control, DMX control in 4-channel and 11-channel modes and a built-in microphone with adjustable sensitivity for sound control. They are also capable of master, slave and standalone operation, and the low noise fan keeps the compact units cool and quiet. They feature 3-pin DMX connectors, Neutrik powerCON mains inputs and outputs plus a key switch to prevent unauthorized use. For audience safety Ioda laser lights are equipped with a "Scan Fail Safety" system. Note: Sharing identical presets, the Ioda lasers are compatible with the Luke series for master and slave operation. With switchable inversion, the master and slave combo is capable of producing the most interesting and impressive laser show effects. Communication standard DMX512 was developed specially for lighting systems in 1986. Up to 32 DMX devices can be daisy-chained and controlled via a control source (e.g. a light mixer). In this type of serial DMX512 “network”, the controlled devices are known as “slaves” and the control source as “master”. The high energy efficiency, the long service life of the LED lamps and the low level of heat dissipation make this device particularly environment-friendly. In simple terms, a device is either controlled or it is used to control other devices. A device that is in “master” mode and in first position in the chain acts as the control source for all the other devices (“slaves”) that are connected. In “slave” mode, the input of a device is connected to the output of a light mixer or “master”. Devices connected to the input of a “slave” likewise act as “slaves”. With additive colour blending, all colours and white are created by blending different amounts of red, green and blue light. The RGB system is used in televisions, computer monitors and digital cameras, for example. In music control mode, the device is controlled via the built-in microphone and can follow the rhythm of the music, for example. In standalone mode, the device functions are controlled via integrated programmes, so no light mixer or “master” controller is required. Its marked directional impact means laser light remains bright and clearly visible over long distances. Lasers are highly energy-efficient and create tightly clustered, narrow beams of light that are ideal for creating pronounced lighting effects. © 2019 Adam Hall Group. All rights reserved.